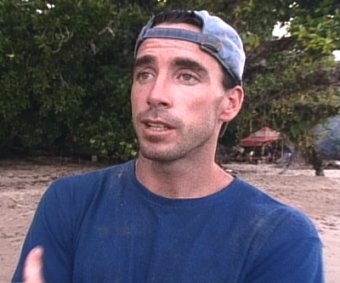 Borneo is the hardest of the Survivor seasons to write about, mainly because it was presented like a documentary. There was very little fancy editing, there weren't that many witty quotes, and for the most part the players didn't go out of their way to be mean to one another. It was very much a survival-type documentary for the first six weeks and that's why it doesn't have the same type of humor level as most of the later seasons. Borneo started off much more like a sociological experiment, it didn't start off like an entertaining over-the-top grudge match. It just wasn't the same type of TV show. And that's why there aren't many Borneo moments on the countdown. However, then we have the case of Sean Kenniff. Yes, that's right. Doctor Sean. The guy with the alphabet strategy. The guy that Sue repeatedly referred to as "dumbass." The guy that built the bowling alley. That guy. Sean seemed like a really nice guy in real life. 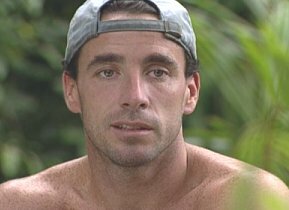 In fact he was probably too nice for a game like Survivor. The guy just was incapable of making any enemies (hence the ridiculous, spineless Alphabet Strategy, which I'll talk about much, much later on this list). 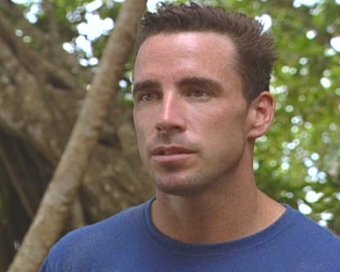 I liked Sean a lot, but unfortunately he did a few things during his time in Borneo that really didn't look so good on TV. He did a lot of things that were just sort of weird. 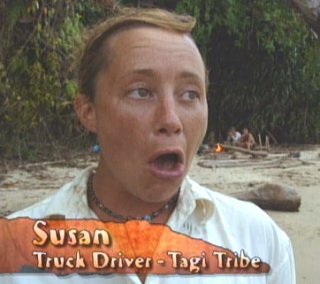 The other players didn't like him, the editors and producers clearly didn't like him, and unfortunately for Sean this turned him into the unintentional comedy champion of the first season. No matter what he tried, or how charming he tried to be... he really came off looking like a big dork. And this is where we come to Superpole. 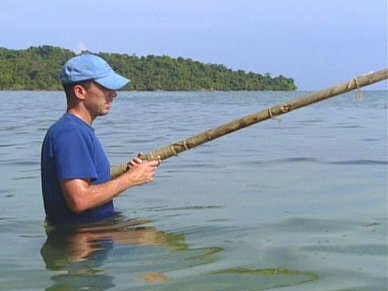 "Superpole 2000" was Sean's invention during the second episode of Survivor. It was a fishing pole, you see. Only it was a lot bigger than a normal pole, plus it had a built-in rod and reel. Hence the "Super" part of the name. This wasn't just a mundane old fishing pole. Oh no, this was Superpole 2000. And it lands Sean the coveted spot at #74. Why was Superpole so goofy? Well for one because Sean never actually caught a fish. He never caught a fish, he never even hooked a fish. Hell, he never even had a nibble. Superpole 2000 was a complete and utter disaster. But Superpole's repeated failures didn't deter Sean in the slightest. No, he built up his invention every single chance he got. We heard about Superpole all the time. We often heard about its many features... starting with "the man's grip" that Sean demonstrated so proudly at the start of episode two. Sean demonstrates "the man's grip." Meanwhile, God looks on in silent approval. Sean also defended Superpole to the cameras. He was very defensive about his invention, and at one time he even suggested that the only reason he wasn't catching anything was because "maybe the area's been over-fished or something." That's right, it has been over-fished. Welcome to the world of Doctor Sean. Remember this quote in defense of Superpole? "That saying... there's a lot of fish in the sea? Well not this sea. Whoever said that didn't grow up in Pulau Tiga." "We don't need Rich. We have Superpole." So anyway, that was that. Richard went on to catch infinity fish, and Superpole never did get a single nibble. It was the complete opposite of a good invention. It even met a sad fate when Richard and Kelly burned it in the Borneo finale. 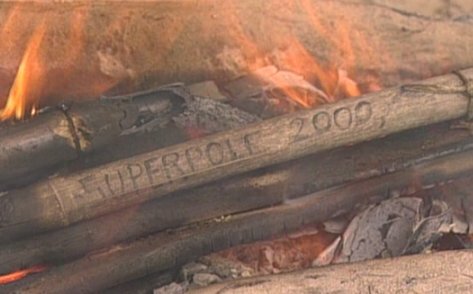 That's right, the editors were so enamored by Superpole 2000 that they gave us a nice, lingering poignant shot of its final moments in the fire during the last episode. Fare thee well, Superpole 2000. Fare thee very well indeed.